Thank You for Supporting our Killarney Elementary School Supply Drive! 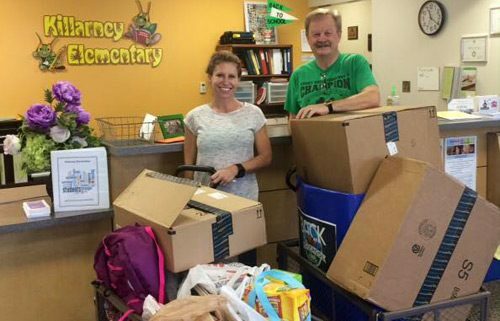 Thank you to all those who donated supplies for our Killarney Elementary school drive! With the help of Kevin and Lee Acker, Broker/Owners at RE/MAX 200 Realty, and all of our awesome customers, associates and staff members…we were able to collect 50 backpacks loaded with school supplies! Every item is appreciated and will be used directly by students in need of basic school necessities. https://homesinorlandoarea.com/wp-content/uploads/2017/10/Killarney-4.jpg 418 500 Remax Orlando https://homesinorlandoarea.com/wp-content/uploads/2019/02/Remax-200-TC-EC.png Remax Orlando2016-09-26 20:16:562017-10-16 20:18:23Thank You for Supporting our Killarney Elementary School Supply Drive!